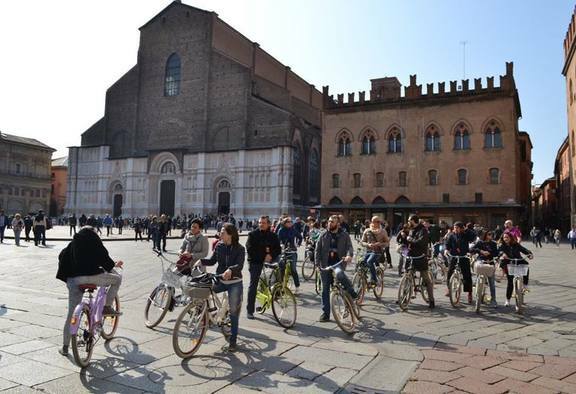 Bologna Cycling Tour is the perfect solution to immerse into the great history of Bologna, the heart of Emilia. Your journey of discovery around the city starts with the beauty of the arcaded streets and the secrets of the medieval town along with a skilled guide, in easy-to-ride city sorrounded by prominent landmarks. You will see the University of Bologna, the oldest university in the world, right next to the full of history Piazza Maggiore. 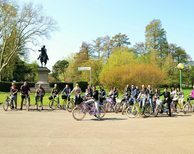 By going for a bike ride to Giardini Margherita, you can enjoy the tranquility and flexibility of a two-wheeled tour. Meet your guide at the Bike Rental BikeInBo, near the train station, and take off on an easy 10 km (6 miles) bike ride through the historic Bologna. Beginning with a look to the modern quarter of Manifattura delle Arti, now the focus of the hi-tech centre of the city, you will be guided around the history of the medieval harbour of Bologna with a focus on the importance of the subterranean canals in Bologna. Arriving at the Prendiparte Tower, an elegant and best preserved tower, will lead your imagination into the past. The discovery of the ghetto will show the importance of the jewish community in Bologna, and then a gaze to the Two Towers, the symbol of this city: Garisenda and Asinelli Towers. Through the classic porticoes you will reach the main square, Piazza Maggiore. This airy, open space is lined with the city's most important buildings: Palazzo d'Accursio, the seat of the city council, the majestic San Petronio Basilica, the elegant Fountain of Neptune and the imposing Palazzo Re Enzo. Discover the Archiginnasio, seat of the University of Bologna, Europe's oldest University. 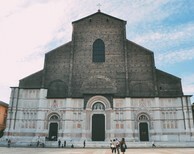 The bike tour continues to the beautiful romanesque façade of St. Dominic Church, built to contain the remains of the saint and house of the masterpiece Ark of St. Dominic, by Nicola Pisano, Niccolò dell'Arca, and a young Michelangelo. After a long breath in Margherita's Garden, the most popular and relaxing garden in Bologna, a mandatory stop is at the Complex of Santo Stefano, seven religious buildings surprisingly interconnected whose origins go back to the dawn of Christianity. To conclude the bike tour, you will look to one of the mystery of this amazing city: the canal to power the medieval mills for the production of the silk is still visibile through a little window in Via Piella; the reason why Bologna is also called "a little Venice".